It is said that the University of Tokyo has well over one thousand faculty members involved in areas related to biology. The number responsible for education in the Department of Biological Sciences is under 80, which, though modest, is no smaller than the personnel establishments of other departments. So, among the university's many organizations for research and education in biology-related areas, what is unique about our Department of Biological Sciences, and what are faculty members and students aiming to achieve? I would like to guide you in search of the answer to this question by telling you about our history, the achievements of earlier researchers in our department, and our present colleagues. First, let us look at the history of the department. Our biology course dates from 1877, when Tokyo Kaisei School and Tokyo Medical School merged to form the University of Tokyo and the Department of Biology was established within the Faculty of Science. Later, the zoology class and the botany class developed into departments. In 1939, the anthropology class developed into the Department of Anthropology. This framework was maintained until 1995, when, with the aim of placing more emphasis on postgraduate education, the Department of Biological Sciences was formed by integrating the faculties of zoological sciences, plant sciences, anthological sciences and the newly established faculty for evolutionary biology. Our department launched a 21st century center-of-excellence (COE) program under the title of “Promotion of Basic Biosciences for the Understanding of Organisms' Uniqueness”, and then a global COE program under the title of “Integrative Life Science Based on the Study of Biosignaling Mechanisms”. Subsequently, our department has been pursuing related education and research activities in collaboration with the Department of Biophysics and Biochemistry, and then with the Graduate School of Medicine and the Institute of Molecular and Cellular Biosciences. This recent trend toward integration would appear to reflect the need for joint research beyond the boundaries of biological specimens and methodologies, and the need for new and more comprehensive education capable of addressing diversities, as we gradually become aware of common principles among different biological species. How has the Department of Biology contributed on a global scale to research and education in the realm of biosciences? Let us review the history to find some examples. 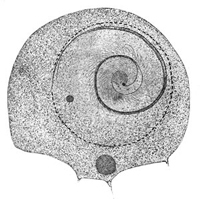 In the middle of the Meiji period, when Japan had just begun to undertake unique research, Sakugoro Hirase and Seiichiro Ikeno successively discovered the sperm of the ginkgo (Figure 1) and the sperm of the cycad. These were world-first discoveries in the area of sperm of seed plants, and they brought instant attention to Japan, which had been lagging behind in the area of scientific research. In an era when biology consisted solely of morphology and taxonomy, Kiyoshi Takewaki pursued a major revolution toward a more modern form of zoology, based mainly on experiments. Takewaki's ideas about many internal secretion mechanisms, which he derived from his experiments involving removal or implantation of endocrine glands, have had considerable influence on what are today deemed to be the most advanced research concepts. During the same period, Takeo Kamata initiated physiological research in the field of basic biology for the first time in Japan. While studying in England in 1931-33, he became the first person to measure membrane potential using glass electrodes. In 1945, after experimenting with injection into muscle cells, he advocated a theory, epoch-making in its time, that muscular contraction was triggered by the increase of calcium ion concentration in cells. In the early 1960s, this theory was verified by Professor Seturo Ebashi of the Faculty of Medicine. Biochemical research started early within the Department of Biology. Hiroshi Tamiya introduced chemical kinetic analyses to make possible a quantitative approach to the life phenomena of plants. Enabling study of photosynthesis by biochemical analyses, this established the basis of photosynthesis researches, in which Japan particularly began to excel. 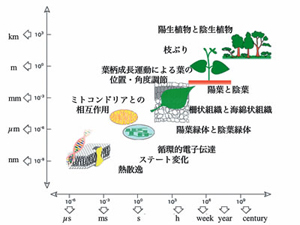 In 1953, Masami Monji and Toshiro Saeki devised a method that allowed quantitative representation of the productivity of plant community in natural environment (production structure diagram). This achievement transformed ecology from a descriptive science to a positive science based on physical laws. In 1961, Hisashi Suzuki organized the Tokyo University Scientific Expedition to Western Asia and succeeded in discovering bones of Neanderthal man. In addition, he collected thousands of human skeletons in Japan from the Paleolithic up to the present, and has won international acclaim particularly for his work in clarifying the secular changes in cranial morphology. Suzuki's work contributed to the proposal in 1991 of the “dual structure model” for the origins of Japanese by Kazuo Hanihara. Based on a major statistical analysis of measurements taken on the teeth and cranial bones collected by Suzuki and others, Hanihara advanced a hypothesis, together with supporting evidence, that the modern Japanese were formed through the admixture of an indigenous population of southeast Asian origin that had occupied Japan from the late Paleolithic Period and a population of northeast Asian origin that began migrating to Japan in the Yayoi Period, and that this admixture was still ongoing. You have now seen how researchers at the Department of Biology (now known as the Department of Biological Sciences) have contributed to basic research as global opinion leaders in the vast realm of biosciences that spans groups and molecules, mankind and plants. The tradition continues today, and our Department of Biological Sciences is a major Japanese center for basic biosciences. After being admitted to the Hongo campus, students are channeled into one of three courses: zoology, botany or anthropology. However, some lectures are common to all three courses. The maximum number of students, as officially announced, is eight for zoology, eight for botany, and four for anthropology. Usually, however, up to 50% more students have been accepted. Education in the Department of Biological Sciences is characterized by intensive training of a small number of students, with an emphasis on experiments and fieldwork. While the maximum number of students per grade is officially set at 20, there are 47 faculty members (more than double the number of students) who are fully involved in educational activities in the Department of Biological Sciences. This illustrates my point about “intensive training of a small number of students”. By way of comparison, the ratio of faculty members to students is 1:1 or lower in most other departments related to natural sciences at the University of Tokyo. Another characteristic, emphasis on experiments and fieldwork, is coupled with the training of a small number of students. Experiments are conducted in the context of each course. As a general rule, students spend the whole afternoon for experiments on four or five days of each week. These opportunities enable a small group of students to be intensively trained in basic experimental methods in biosciences, the latest techniques for experiments, how experiments should be planned, and how observations should be made. The students also participate in fieldwork. Students in the zoological course take part in maritime fieldwork; students in the botany course participate in maritime fieldwork and outdoor fieldwork in such places as Yakushima and Nikko; and students in the anthropology course also have outdoor fieldwork, in which they study biological species (individual or group) in natural surroundings. Such opportunities to experience the diversity of biological species help to give students a broad and deep understanding of living things. Students in the anthropology course carry out anatomical dissection of human bodies. This is the only course outside the Faculty of Medicine that performs such a procedure. These opportunities for practical experience are aimed not only at imparting skills but also at fostering deep understanding, as opposed to just conceptual knowledge, of living things through direct contact with them. Many students who graduate from our department become researchers. But, even those who choose different careers really appreciate the deep understanding they have gained about living things. After graduating from the undergraduate school, about 80% of students further their studies in the Department of Biological Sciences. The Department of Biological Sciences comprises main course instructors (15 professors and 15 assistant professors/lecturers) and supplementary course instructors (25 professors and 23 assistant professors/lecturers) including those at the Botanical Gardens of the Graduate School of Science and at the Marine Biological Station. Students can choose their mentors from a very wide selection of instructors. The Department of Biological Sciences accepts 61 students per grade into the master's course and up to 40 students per grade into the doctor's course, preparing more students in the graduate school than in the undergraduate school. In addition to zoological sciences, plant sciences and anthropological sciences, the graduate school provides the additional choice of evolutionary biology. Those of us who are responsible for this new field study teach students about evolution using various approaches, from genome study to morphology and from population genetics to molecular biology. Our courses on evolutionary biology enjoy participation by a number of researchers from national museums. In the graduate school, students spend most of their time conducting their own research projects. Most lectures fall into one of the categories of zoology, botany, anthropology, or evolutionary biology. Graduate students can freely choose among the available lectures. In addition, students can attend lectures that are parts of the global COE program. Among such lectures, the most popular are English lectures on international studies on the basis of life, given by world-famous scientists such as the discoverer of homeobox genes and the author of globally acclaimed textbooks on developmental biology. After graduating from the graduate school, many students become researchers. According to statistics covering the period 1958-1994, 60% of graduates became university lecturers/professors and 15% of graduates became researchers at non-university research institutions. In recent years, however, graduates have tended to choose careers in more diverse fields, including mass media and patent law. In the last ten or so years, genome sequences for various forms of life, from monads to humans, have come to be understood, which has spurred progress to all-inclusive studies based on this knowledge and comparative studies in biological sciences, not only among biological groups and families but also between animals and plants. As a result, biology has now entered an exciting new phase. For example, genomes provide a common platform for exchanges among taxonomy, physiology, genetics, evolutionary science and other disciplines which previously were almost inconceivable. In what direction is our department moving in this new trend of biology? To help you think about this question, I will describe some recent research topics pursued by the Department of Biological Sciences. Apes: Ever seen a fat gibbon? A group led by Assistant Professor Takafumi Ishida was studying the skin colors of man and the hair colors of apes. While great apes have monotonal hair coloring, the lesser apes, gibbons, have richly diversified hair coloring. Starting from this observation, the group studied the genes related to synthesis of pigments, and found that a large part of the genome, including one hundred thousand base pairs, was missing in gibbons. Interestingly, the hundred thousand base pairs included a gene related to fat metabolism. It is believed that ancestors of the gibbons began living in trees in order to escape from carnivores that crawled on the ground. 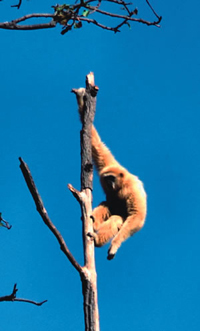 The slimness of gibbons (Figure 2) equips them for living in trees and jumping from branch to branch, and this slimness may have something to do with the genome going missing from their genome. Even though the group was focusing on color as a phenotype, the question of obesity arose unexpectedly as a consequence of studying DNA for clues. Honeybees: Metamorphosis hormones govern even their social behaviors. In the brain of a honeybee, the mushroom body, a higher center in insect brains, is well developed and changes its size in accordance with the way labor is divided among worker bees. 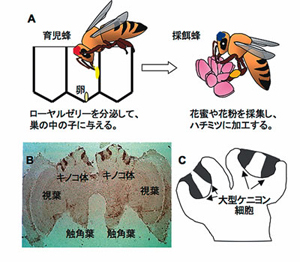 A group led by Professor Takeo Kubo undertook a comprehensive search for and identification of genes that could influence the social behaviors of honeybees, namely, those genes that are expressed selectively in the mushroom body of the brain and those genes that are expressed differently depending on their behaviors. Their findings suggested that the ecdysone signaling system, which functions in insects during the metamorphosis from larva to adult, also functions, in the case of honeybees, to bring about a switching in the mushroom body neural circuit, triggering a change in behavior of the adult honeybees (division of labor), as shown in Figure 3. A: It is possible that a modal switching between two ecdysone signaling pathways in a mushroom body (between red and blue as modeled) governs switching of roles between a nurse bee and a forager. B: The gene for Mblk-1, a transcription factor in the ecdysone signaling system, is expressed only in some neural populations in the mushroom body. Plants have structures that are designed to catch more light. A group led by Professor Ichiro Terashima studies photoreceptive mechanisms in plants and the ecological significance of such mechanisms. The group is revealing how these mechanisms for better catching of light work on various scales, such as those of molecules, organelles and organs, and at both individual and group levels (Figure 4). For example, the overall photoreceptive efficiency of a branch is increased by minimizing mutual shading among leaves as the positioning of each leaf is controlled by the growth of its stem toward a direction determined by the position of the light source (sun). Moreover, tissue inside each leaf consists of palisade tissue on the lighted side, which attracts light into the leaf, and spongy tissue on the shaded side, which completely absorbs the light. When light is directed onto the underside of leaves, the spongy cells transform themselves into palisade cells. Thus, these mechanisms are plastic. Figure 4: Adaptation of plants to light conditions takes place on various scales. Flagella and cilia are important to animals as the apparatus for cellular movement. The basal body (centriole) at the base of the flagellum has a cylindrical structure consisting of nine short microtubules, and serves as a core around which a network of microtubules (tubular protein polymers) is formed. Once in a cell cycle, a new centriole buds from the side of an existing centriole. Details of this “self-duplicating” mechanism are completely unknown, and remain a great mystery in modern cell biology. 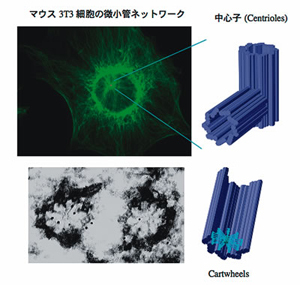 A group led by Associate Professor Masafumi Hirono and Professor Ritsu Kamiya, after studying many Chlamydomonas mutants without flagella, succeeded in obtaining a mutant that totally lacked centrioles. From examining this mutant, called bld10, they discovered that it had a protein abnormality that constituted the cartwheel, i.e., a structure comprising nineradiating fibers that appears in the initial stage of centriole development (Figure 5). This discovery provided a clue to the most mysterious, initial stage of the centriole formation mechanism. A newly found small peptide hormone controls the maintenance and differentiation of plant stem cells. In multicellular organisms, cells communicate with each other as they form themselves into tissues and organs. In animals, intercellular communication is often achieved by contact between cells. In plants, however, such communication by contact is impossible because the membranes of different cells are separated by thick cell walls. So, how do plant cells exchange information? A group led by me (Professor Hiroo Fukuda) studied the unicellular transdifferentiation induction system of plants to look for signaling molecules that contributed to the differentiation and maintenance of plant stem cells. This study resulted in the discovery of TDIF, a small peptide composed basically of 12 amino acids. Because 26 different peptides similar to TDIF were encoded on the Arabidopsis genome, we chemically synthesized the 26 species of peptides and examined their activity. The 26 species of similar peptides served diverse functions; they separately controlled the functions of stem cells in the vascular bundle, shoot apex (Figure 6) and root apex. This discovery provided a new insight into understanding the switch between differentiation from and maintenance of plant stem cells. Figure 6: Inhibition of shoot apical meristem formation by a small peptide known as CLV3. A shows -CLV3; B shows +CLV3. Angiosperms, which can be divided into as many as 250 thousand species, have a very wide diversity in the form of their flowers. It was already known that, in the case of dicotyledonous plants, carpel development was controlled by the AG gene that belongs to the MADS-box family. However, a group led by Professor Hiroyuki Hirano discovered that, in the case of grass species in monocotyledonous plants, the DL gene, which belongs to a gene family distinct from the MADS-box family, controlled carpel development. The AG gene was known to be a multifunctional gene that regulates stamen development and meristem determinacy, in addition to carpel development, in dicotyledonous plants. By contrast, the AG orthologs in the grasses, which were duplicated during their evolution, have been subfunctionalized to regulate separately stamen development and meristem determinacy, and have lost the function for carpel development. This discovery provided a new perspective on gene duplication in plants and on subsequent evolution. All of the research activities described above are highly original leading-edge projects. I am sure the reader will have got a feel for how much satisfaction these projects have given the researchers concerned. We deal with subjects and methodologies such as genomes, genes, proteins, molecular biology, cell biology, and the like, which tends to encourage reductionism. However, research activities in the Department of Biological Sciences transcend this tendency and are aimed at revealing more about the life-rich systems of living things. Among the various biology-related departments of the University of Tokyo, what makes the Department of Biological Sciences unique? The conclusion is left to the reader, but I would like to mention the following: Our department pursues research and education in biology with a deep respect for life and the individual uniqueness of each living thing. Although it is commonly held that immediate utility is the mission of science, our research is dedicated to unveiling knowledge that can be of real service to mankind. And we believe that the revelation of profound truths is the only real service to mankind.